This section is about the trees, woodlands and hedgerows, ancient, veteran and modern, of Dallington Parish and its surroundings in the High Weald AONB. Getting the local community involved in tree planting of any kind, e.g. woodland, orchards, memorial trees, etc. Our current Tree Warden is Doug Edworthy and he can be reached on 07711 090 925 or treewarden@dallington.org.uk. For more information, including maps of ancient woodland, historic settlements, ancient trackways, and much more for every parish in the High Weald, go to http://www.highweald.org/downloads/publications.html and find the ZIP file of ‘Dallington Landscape Character Maps’. It is a large 65.75 MB file but well worth downloading if your broadband speed allows. We would like to have the individual maps available as separate files on the Dallington website but copyright issues prevent us from doing so at the moment. Would you be interested in ‘Tree Walks’? 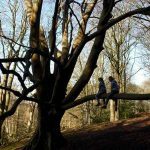 Do you know of any special, rare or interesting trees in the Parish? What do Dallington’s trees mean to you and to your family? Doug is very interested to hear your ideas and how you would like to celebrate Dallington’s trees.